He was known to bury his feelings. A great actor with a greater teacher. A teacher who taught him that when you were born and cried, your mother wasn’t there to hold and comfort you, for she abandoned you. A teacher who taught him that being bounced from foster home to another only meant friends changing and never settling in. A teacher who taught him that he is not wanted, a dog when families required puppies. So it went on… a child living everyday wishing it was his last and not feeling anything because, come to think of it, why would he want to feel anything? So he buried a piece of himself. When He turned 18, he was given the opportunity to leave the home and find his way in the world so his teacher encouraged him to do so, just to slam every door in his face. It was difficult to find a job, any job, so he looked some more. Persisted and chose to bury all feelings of disappointment when he was turned down at interviews. Until he found a job that required him to work night shifts moving truckloads of trash away from civilization. So he drove all the way out every night, and buried a piece of him. His life got better: the orphan boy who could. Many people invited him to their homes, it was a way his teacher showed him what he never had growing up but he still looked with curiosity. He buried all feelings of longing and envy. His teacher taught him that there is a person out there for you when he met his girlfriend, then he found out that things can only get better… just to get worse. So all he did was bury a relationship before it ever became anything. 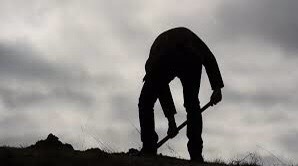 He buried his hopes and dreams of a family when he buried his heart. The more he learned, the more he grew. The more he grew, the more he buried.